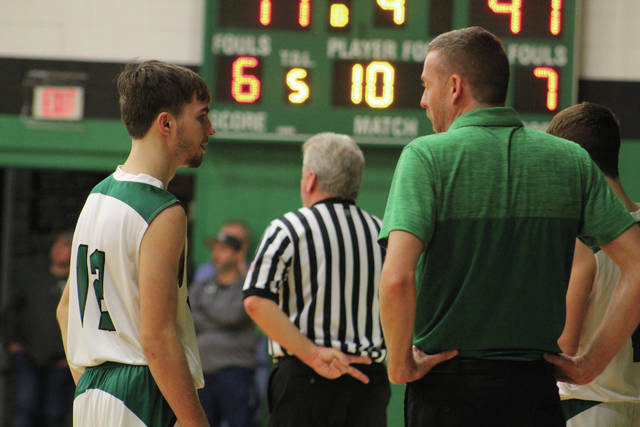 Green head coach Dirk Hollar talks with Rylee Maynard during the fourth quarter of a prior affair. Behind a trio of huge performances from Tanner Kimbler, Tayte Carver, and Gage Sampson among with the rest of the crowd, the Green Bobcats’ boys basketball program obtained a critical SOC I victory against New Boston at home on Friday evening as the Bobcats defeated the Tigers, 91-78, in a clash of two of the top-four SOC I programs over the course of the 2017-18 season. Green, who hit eight threes during the affair, scored 51 of its 91 points in the first half en route to getting off to a blistering pace. The big three of Carver, Kimbler, and Sampson were right in the middle of the action the entire time as Kimbler knocked down four of his five threes in the first half en route to a 12-point first half, while Carver (14 first-half points) and Sampson (12 first-half tallies) used their slashing abilities to cause problems all evening. In addition to the efforts of the aforementioned trio, Rylee Maynard ultimately added both of his threes in the opening half en route to putting together six points in the opening pair of stanzas en route to supplying a major spark of his own, while Zach Huffman made the going difficult from Kyle Sexton on the low block. Their efforts proved to be critical as a 30-point second quarter put Green ahead by a 51-34 count at halftime after the Bobcats played New Boston to a 21-17 margin after a quarter of play. In the second half of action, Conley got going as the senior ultimately obtained 17 of his 27 points in the second half of action, while Tyler Caldwell, who nailed a pair of threes en route to a 20-point outing, and Kyle Sexton, who added a double-double into the equation with 12 points and 16 rebounds, allowed New Boston to keep hanging around. But even with Kimbler’s playing time limited in the second half due to the four fouls that the senior obtained in the third quarter of action, Carver and Sampson proved to be critical as the pair obtained 14 and 13 second-half points en route to obtaining 28 and 25 points, respectively, en route to the victory. Green, who also obtained a 51-32 victory over Clay on Saturday evening, will play a makeup game with South Webster on Wednesday evening at home before traveling to Western on Friday evening. Despite obtaining 19 points from a red-hot Matthew Fraulini and 13 additional tallies from Daniel Jordan, the Portsmouth Trojans weren’t able to claim victory over the Fairland Dragons in a road contest between the two programs on Friday evening as Portsmouth fell to Fairland, 69-48, in an Ohio Valley Conference bout that was held in Proctorville. Fraulini, a sophomore guard who has proven himself as one of the better underclassmen in the area, knocked down five three-pointers en route to a 19-point outing. Jordan’s 13 points came off of six field goals and a free throw. Isaac Kelly, DJ Eley, Reese Johnson, and MyQuel McKinley combined for the remaining 16 points for Portsmouth, with Kelly leading the way of that contingent with six points, to round out the scoring. Kollin Van Horn led Fairland with 21 points while Isaiah Howell, who canned four three-point attempts en route to 16 points, and Ty Wilcoxson, who added 12 tallies of his own, joined Van Horn in double-figures. Despite obtaining a well-balanced scoring effort and jumping out to a 37-29 halftime advantage, a 25-8 third-quarter spurt by the Symmes Valley Vikings’ boys basketball program proved to spell doom for the East Tartans’ boys basketball program as East fell to Symmes Valley, 67-58, on Friday evening in Sciotoville. Will Shope, who proved to be fantastic in the first half of play on Friday evening, ultimately obtained 13 of his 14 points in the opening half en route to pushing the Tartans out to an eight-point halftime lead. Fellow upperclassman hand J.D. Hatcher added seven of his 10 points in the opening pair of stanzas to aid East’s early barrage, while Michael Bivens added five points in both halves to allow the senior to grab 10 points on his own. Zach Garrett added seven of his nine points to aid East in the second half while Devon Stevens scored all six of his points during the first quarter of play. Austin Smith, Jordan Huffman, and Brayden Queen combined for the remaining nine tallies. As for Symmes Valley, Layken Gothard proved to be stellar once again on Friday evening as the senior put together an incredible effort. Gothard not only scored 18 of Symmes Valley’s 29 first-half points to keep the Vikings in it, but nailed four of his five threes in the opening half of play en route to doing so. The senior, who ultimately finished with a team-high 26 points and seven steals in addition to eight rebounds, was also big from the free throw line, serving as the only player on the Vikings’ roster to shoot better than 50 percent from the charity stripe (5-of-7). In the second half, Brock Carpenter and Austin Mannion ultimately took the load off of Gothard with their own major contributions. Carpenter scored 12 of his 13 points in the second half and was huge on the glass with 17 rebounds, while Mannion obtained nine of his 13 points in the second half en route to putting together one of the best performances of his high school basketball career on Friday evening. Jack Leith’s 10 points and five steals, along with Hunter Adams’ nine rebounds and four points, also proved to be critical for Symmes Valley, who improved to 9-8 overall and 5-7 in SOC I action with the victory. East, who fell to 3-10 overall and 3-7 overall in SOC I play, will play at Notre Dame next Friday, while Symmes Valley will host Clay on the same evening. Behind another balanced scoring effort that saw three players obtain double-figure point totals, the Portsmouth Trojans’ boys basketball program responded from its loss to Fairland by bouncing back and claiming a big 54-42 road victory over the Rock Hill Redmen on Saturday evening in Rock Hill. From the outset, it didn’t take long for Portsmouth to get going as the Trojans immediately got going behind the play of Matthew Fraulini and Daniel Jordan. The duo, who combined for 32 points the night prior against Fairland, obtained 24 of Portsmouth’s 54 points on Saturday evening, with the pair scoring each of the first 10 points of the contest as Jordan obtained a pair of low-post baskets while Fraulini banged home two consecutive treys to put the Trojans up 10-2 to begin the contest. Jordan then added four more points in the quarter as the Trojans ultimately established a 17-12 lead after a quarter of play. In the second frame, Reese Johnson and DJ Eley took over where Fraulini and Jordan left off as the former pair combined for all 10 of Portsmouth’s points, with both players countering a three-pointer with a two-point basket en route to establishing a 27-19 advantage for the Trojans at halftime. Rock Hill ultimately cut the deficit to a five-point gap in the fourth quarter of play, but Portsmouth closed out the affair on a 10-2 run en route to taking home the 12-point victory. Jordan ultimately finished with a game-high 13 points while Fraulini and Johnson followed with 11 points apiece. Eley’s nine points, along with seven tallies from Issac Kelly, were also critical in the final result. Portsmouth, who moved to 11-6 overall and 6-5 in OVC action, will have a rematch against Rock Hill on Tuesday evening. Putting together one comeback in a single year is always great to have ownership of. However, when one team does it twice, to the same team, en route to sweeping the season series against said team, there aren’t many things that are sweeter than having ownership of such an accomplishment. On Saturday afternoon, the New Boston Tigers, staring its second straight loss in a 20-hour span dead in the face, used a special spark from Tyler Caldwell to get the ball rolling. With New Boston trailing the Ironton St. Joseph Flyers with just three minutes to go, the 6-7 junior scored nine fourth-quarter points, including seven in a row with the Tigers trailing by six, to rally the troops and give New Boston its second victory over Ironton St. Joseph in an 11-day span as the Tigers took home a 56-51 victory over the Flyers in Ironton. Caldwell, who scored 15 of his 17 points in the second half of play, nailed two big threes, the first coming at the end of the third quarter, to keep New Boston around. The junior then got his personal spurt rolling by connecting on a second three-pointer to take a big bite into the lead as the Tigers cut the Ironton St. Joe lead to three, then added a two-handed breakway jam not long after. On the following offensive possession after the dunk, Caldwell battled into the middle of the paint and put together a strong finish to give New Boston the lead for good. A pair of free throws from Kade Conley, along with a steal and a layup from Drake Truitt, allowed the Tigers to close the game out in grand fashion. Of all of the contributions, however, none proved to be much bigger than the performance that Kyle McQuithy put together. With Conley saddled with foul trouble and Truitt, along with Eddie Phipps, battling the flu, McQuithy knocked down all three of his attempts from three-point range in the first half en route to a 12-point outing, effectively spreading the floor for Caldwell and Kyle Sexton (16 rebounds, five blocks) as the pair began to get going due to the increased amount of room to work. Despite essentially playing just two quarters, Conley finished with six points, six rebounds, and four assists to aid New Boston, who improved to 13-4 on the season ahead of a Tuesday evening showdown against West. Despite putting three players in double-figures, Morgan Wiseman’s 24-point output proved to be too much as the Waverly Tigers’ girls basketball program was able to edge the Northwest Mohawks’ girls basketball program by a 51-44 count on Saturday afternoon in McDermott. Northwest was led by Valerie Eury, who obtained 10 of her 13 points in the second half for the Lady Mohawks, while Magen McClurg collected a dozen points on her own. Keriah Potts added 11 for Northwest to round out the strong effort. The Lady Mohawks were only down one point in the fourth quarter, but Waverly’s Morgan Wiseman proved to be too strong as Wiseman ultimately hit six three-pointers en route to a game-high 24 points. She scored 10 of her 24 tallies in the first quarter of play to get the Lady Tigers off and running during the contest and added three rebounds to go along with three steals for the affair. Zoiee Smith’s 11 points, five assists, four steals and two rebounds, along with Kami Knight’s 10 points, three rebounds, and two steals, proved to be vital for the Lady Tigers, who moved to 8-12 overall and 5-9 in SOC II play. Waverly will take on Hillsboro on Wednesday evening before traveling to Portsmouth for its final regular season bout. Northwest, meanwhile, will face West Union on Monday evening before closing out its season with a Thursday evening bout against the East Tartans’ girls basketball program.